There are two sets of lights at the back of the Elise S2. The two centre one of these were ment to be enabled but at the 11th hour Lotus had to disable them due to EU regulations. This guide is concerned with enabling the two missing rear lights. Here’s how to do the wiring. Naturally, this will have to carry the usual ‘Don’t blame me if you car goes on fire’ caveats – this is what I did, copy it if you like but at your own risk. I am assured by Nick Adams that the wiring and fuses for the lights were designed with this in mind and, therefore, are perfectly adequate for the extra load. 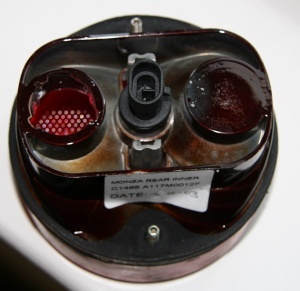 Before commencing, you will need to have a pair of leads (5 Amp) connected to the ‘new’ bulb holders for the soon-to-be tail lamps and also a lead attached to the ‘new’ contact in the base of the foglamp bulb holders. You will need six ScotchLok connectors to do the job, together with a pair of 5W bulbs and, possibly, a couple of P21/5W bulbs. Remove the wiring harness for the ‘inner’ light unit from one side of the car. This will have one (dual filament) bulb holder attached, together with the small (reversing light) connector. Remove the ‘new’ (single or dual filament) bulb holder from the ‘blank’ segment of that light unit. Locate the ‘earth’ leads from the harness. These are black leads which are joined together inside a ‘shrink-fit’ black sheath. Don’t confuse them with the black (positive) feed to one of the lights (which does not go into the shrink-fit sheath). Your ‘new’ bulb holder should already have its two leads attached. Connect its ‘earth’ lead (which links to the contact in the bulb holder which connects with the casing of the bulb, NOT the base) to one of the leads entering the shrink-fit sheath, using a ScotchLok connector. (Halfords sell them, get the 5 Amp type). The dual filament bulb holder, which currently houses the foglamp bulb, should have a spare lead coming from it. This should be connected to the unused ‘new’ contact in the base of the bulb holder (the positive feed for the 5W filament). Connect this to the second (i.e. ‘positive’, not ‘earth’) lead of the ‘new’ bulb holder. Insert a 5W bulb into the ‘new’ bulb holder. If, like me, you find Lotus have used a dual filament bulb holder, then fit a P21/5W bulb – this will be a much better fit, even though the 21 filament is redundant. Remove the wiring harness from the adjacent OUTER light unit from the car. Identify on this the positive feed to the tail lamb bulb (probably a red lead). Remember that this is the wire which leads to the tail lamp (not the tail/brake lamp), but which does not join to the shrink-fit sheath. To the lead mentioned in 8, connect the positive lead from your ‘new’ bulb holder (which you have already joined to that of the fog/tail lamp). Allow a good few inches of wiring on all your connections. Reinstall the harnesses and bulb holders onto the car. Test the function. If all is well, repeat for the other side. 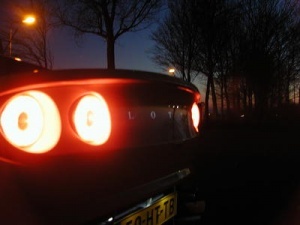 2003 and later Esprits use the same rear light units and they are also part of the conversion kit available for earlier Esprits. The bulb holders are also used on the rear on Ford Fiesta Mk 6 3/5 door, years 2005 - 2008, and can be found used on ebay, and also new e.g. from ebay seller "boltonbits". The bulb holders are made by Cemm-Thome from france, but don't bother contacting them unless your require quantities in the thousands! This page was last modified on 17 February 2018, at 17:08.